This entry was posted in Magical Memories, Silent Saturdays and tagged family time, snow fort on March 7, 2010 by Amy. Remember the show Mad about You? We loved that show! Paul and Jamie were newlyweds. We were newlyweds. Paul and Jamie had a dog. We had a dog. Paul and Jamie had a slanty floor in one part of their apartment. We had a slanty floor in one part of our apartment. Jamie went back to school. I went back to school. Paul and Jamie had British neighbors. We bought a house and had a British neighbor. Paul and Jamie had a baby. We had a baby. We used to laugh so hard at their life because we could relate so well to it. Time froze for Paul and Jamie when the show went off the air. We kept moving forward. But every now and then, something will remind us of them. 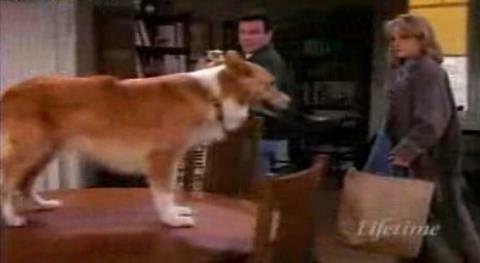 Like the time they walked in and found Murray, their dog, standing on the dining table. Paul looked at Murray and said, “This is new.” and just kept walking. Earlier this week, I walked into the dining room and saw this. To which I said, “This is new.” and just kept walking—to get the camera. This entry was posted in Magical Memories, Silent Saturdays on February 20, 2010 by Amy. This entry was posted in Magical Memories, Silent Saturdays and tagged Daddy Daughter Dance on February 6, 2010 by Amy. This entry was posted in Magical Memories, Silent Saturdays and tagged family time, holiday on January 30, 2010 by Amy. Yup, there it is, more alliteration. I’ve heard some bloggers do Wordless Wednesday–where all they post are pictures. I’ve never been one to follow the crowd so I’m going with Silent Saturday. Maybe it’s what my head needs after the cacophony of Saturdays when all the kids are here, and often, some of their friends too. Sarah: The. Best. Surprise. Ever. This entry was posted in Magical Memories, Silent Saturdays on January 23, 2010 by Amy.